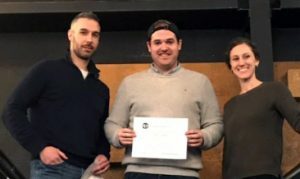 York University graduate students Catherine Bellissimo and Patrick Turnbull received awards at the Ontario Exercise Physiology (OEP) Conference held Jan. 27. Both are PhD candidates in the laboratory of Associate Professor Christopher Perry, School of Kinesiology & Health Science, and the Muscle Health Research Centre at York University. They were named as two of the three recipients of student awards at the conference. 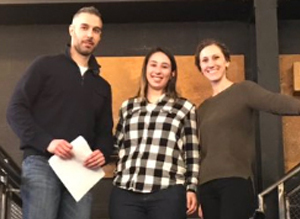 Catherine Bellissimo (centre) during the awards[/caption]Bellissimo received the top OEP 2019 Student Award, which recognizes outstanding research conducted by a graduate student within the field of exercise physiology. This award recognized her recent findings on developing a novel drug therapy to prevent muscle weakness in Duchenne muscular dystrophy, a debilitating disease that affects one in 3,500 males, leading to severe immobility in addition to breathing and heart disorders. At this same conference, Turnbull received the American Journal of Physiology Cell Award, which recognizes outstanding research by a student in the field of cell and molecular physiology. Turnbull received this award for demonstrating how the antioxidant status of cancer determines whether a cancer cell grows or dies after turning on fat metabolism. His research used a unique crossover application of classic pathways explored in the exercise physiology field to understand how nutrient signalling can affect this debilitating disease that greatly affects quality of life and mobility in millions of people. Turnbull has also received a travel award from the American Society of Biochemistry & Molecular Biology (ASBMB) to present this research at the international meeting Experimental Biology (with more than 5,000 delegates) in Orlando, Fla., this April. Bellissimo and Turnbull were among the nearly 100 students from across Ontario who were considered for the awards. Their research excellence was noted for focusing on understanding how poor cellular metabolism contributes to diverse disease, and developing novel therapies that target metabolism. “These awards also reflect their ability to teach complex knowledge in health to a broad audience in a clear and meaningful way,” said Perry. Perry said the spectrum of pure and applied research embodied in their theses reflects the diverse breadth of translational research in the School of Kinesiology & Health Science, and the Muscle Health Research Centre, which focus on understanding how physical activity affects health from cell to whole body, and reciprocally how various diseases limit the ability to be physically active. The awards received by these two students reflect their achievement in research excellence as they develop into independent scientists focused on improving health and well-being, said Perry.